Yes, of course someone of my age remembers the Keep America Beautiful “People Start Pollution, People Can Stop It” commercial in the early ’70s, but we were yet to connect what we were doing and how it contributed to the ultimate downfall of the health of the planet. If you worked for a small scene shop, as I did in the early days, you got used to reusing as much as you could, just to save on costs. Wood and dumpsters both cost money. Still, much was thrown away. Then, when bottled water started to become a more regular thing, it was ubiquitous on shoots, and this, of course, was before single-stream recycling was widely available. The “battle of the bottle” would become one of the main points in getting crews to change their habits and use reusable bottles instead of disposables. Back in the early ’90s, some media industry visionaries got together to form the Environmental Media Association, which advocates for sustainability within storylines, rallies celebrity endorsement for environmental endeavors, and holds an annual star-studded awards ceremony. Much of what you read in the sustainability press deals with large industries like agriculture, manufacturing, travel/transport and energy, and yet the worldwide entertainment industry is set to top $2 trillion in 2016. The entertainment industry and celebrity association is also a major influencer in consumer behavior and purchasing habits, and it’s mentioned as part of a UNEP report on how to push sustainability with the general public of consumers. So, what has this behemoth of an influential industry done to make itself more sustainable inside and out? Here in the U.S., most of the major film studios have sustainability departments that coordinate with sustainability managers on some, most or all of their productions. These managers work with all departments to cut down on landfill waste and carbon emissions. The Producers’ Guild of America has a quite extensive online guide and services directory as part of its PGA Green Guide Initiative. It published a landmark report in 2014 that illustrates to producers and filmmakers that sustainability plans, implemented from pre-production onward, can help save a production money. That report was penned by Emellie O’Brien, a New York-based sustainability advisor. Through her company, Earth Angel, she has advised on numerous blockbusters like Sony Pictures’ “The Amazing Spiderman 2” and the upcoming “The Queen of Katwe,” which partially filmed in Uganda. Online and brick-and-mortar resources like ArtCube (New York-based but international), Strike it Green (New Orleans), Ready Set Recycle (Toronto, Canada), Scenery Salvage and Dresd (the U.K.), help production people recycle sets, props and costumes. Other organizations provide low-wattage lights, solar generators, compost and food donation and collection, among many other useful services. The list of sustainable production service providers is growing, just as sustainability-based businesses are growing outside the entertainment industry. The U.K. has its own guide, like the PGA Green Guide in the U.S., which includes a carbon calculator and a services directory, here on We Are Albert. The U.K. also passed an official government standard for sustainable media production with its BS 8909 Standard for Sustainable Production. Also, in Europe, the Netherlands Film Fund appointed a head of sustainability, which was a result of efforts by the Green Film Making Project to make production more sustainable there. 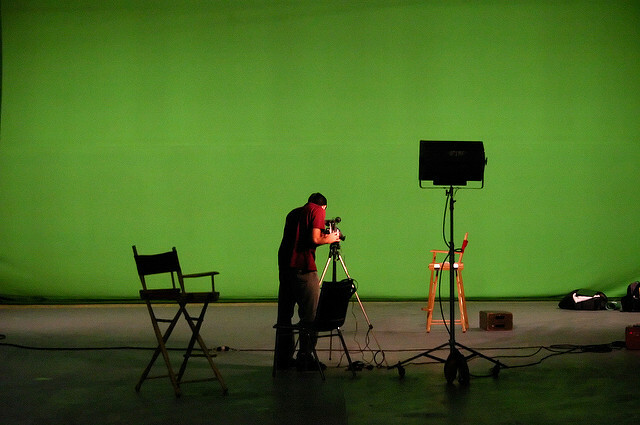 Germany-based Green Film Shooting is doing a fine job of covering the international scene of sustainable production. In France, Eco Prod works with productions and provides a resource for sustainability within the industry. The group helped organize an international panel just prior to COP21 back in December and published this informative brochure. It was also part of the effort to pass a charter at COP21, championed by the World Bank’s Connect 4 Climate and Film 4 Climate Initiatives. A charter will not succeed without universal and international cooperation, however. In the course of us doing business, we have also become aware of efforts to “green the business” in Italy and in India, one of the world’s largest media producers. This is all good news, but, like any large industry, true industry-wide change won’t come until there is buy-in from the top producers and UPMs (Unit Production Managers — the on-the-ground managers of budget and resource allocation on a production), to department heads, to the crew members to even day player “background” aka extras. As a business, the entertainment media industry is all glamour on the surface. But underneath, it is produced by groups of people — skilled people who work 12+ hours a day, utilizing large amounts of resources: from the many vehicles in a production’s fleet, to the food and drink provided to cast and crew, to the clothing and costuming, sets, props, cleaning products, paper products, product placement, hotels, locations rented, studios and warehouses used for filming, to the power provided along with the stories being told and how they’re being told. Making over this industry as a model for sustainability in the 21st century can seem a Herculean task. Public awareness can help. Just as public demand for better food production, better apparel production, more energy-efficient vehicles and appliances, and safer cleaning products and cosmetics has bolstered efforts in those industries, so can public demand for a more sustainable entertainment industry, push forward efforts for improvement, and vice versa. Not only was “Star Wars: The Force Awakens” the film to see this winter, but it was also made with sustainability practices firmly in place. It may well unseat “The Amazing Spiderman 2” as the largest sustainably-made blockbuster to date, and this, of course, is a fabulous development. For the agreements set forth at COP21 to succeed, the sustainable business community must evolve into just “the business community.” The “sustainable entertainment community” must do the very same thing. Beth Bell is the founder and president of Green Product Placement, the first Entertainment Resources Media Association product placement agency that specializes in placing and promoting green, sustainable, socially enterprising and entrepreneurial brands in mainstream entertainment media. Since their launch in early 2012, they have placed over 70 good brands in over 170 productions in the US, Canada and the UK. Ms. Bell has a degree from University of North Carolina School of the Arts, and has worked professionally in television and film production since the late 80’s, and has worked and consulted in entertainment, media and event management and marketing for over 15 years. She has spoken internationally on the subjects of: product placement, green marketing and entrepreneurship.